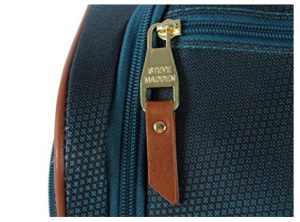 Steve Madden, TPRC Luggage, and Original Penguin Luggage, what do all of these companies have in common besides their recognizable brand names? Each of these brands offers some of the highest quality travel gear for adventures all around the globe, especially products and suitcases which are top of the line due to their modern advancements and designs which are the basis of new research, excellent and smart material usage, and the recent travel technology and innovation. But when it comes down to picking just one suitcase – since that’s all the typical traveler on a budget can afford – which one of these brands should you go with? 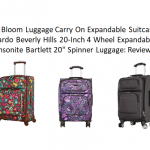 For your convenience the research into these products has been designed to fall into four separate categories that compare side by side with nothing but the facts: Suitcase Storage, Materials/Durability, Additional Features, and Size/Style Options. 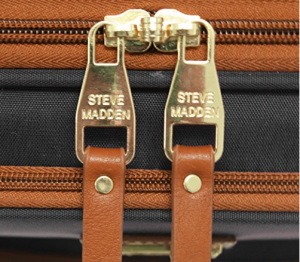 Not only does Steve Madden offer a great 5-year warranty on all their products including this under-seat one-of-a-kind original, but for carry-on options Madden bags can actually be quite affordable. 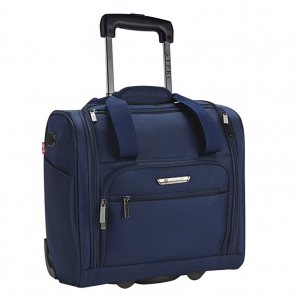 At face value, this suitcase is also great to look at, very professional looking, and features a fantastic single pole handle and in-line skate wheels for movement over any terrain be it carpet or urban streets. One of our favorite things about this bag is its stylish look, on top of this it has a massive domed space with tons of inner organizational pockets. 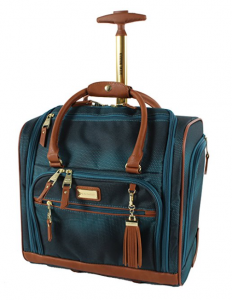 On the exterior it offers three stylish pockets with tassel-pull tabs and further space for the little necessities of travel. It’s a great size for a laptop under 14 inches, or even better just a tablet or kindle reader. 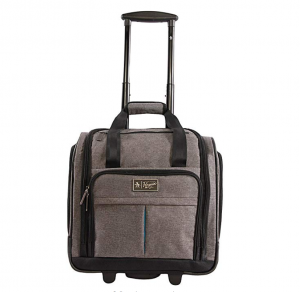 Designed with a mixture of nylon and polyester materials, this bag is durable enough to withstand all the rigors of travel while still being able to fold and fit under your seat or sit at your feet. 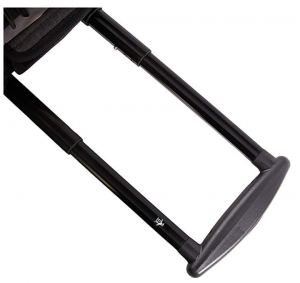 Additionally, it includes a very strong single rod telescopic handle. 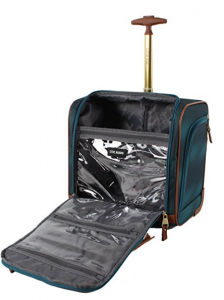 This bag offers kickstand in-line skate wheels and strong self-repairing zippers. 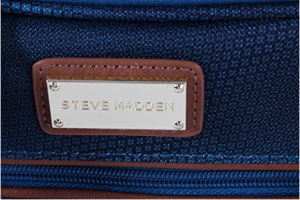 In this review of Steve Madden luggage, it’s important to know that this under seat option is also part of a larger set which includes a carry-on bag, checked medium, and checked large. 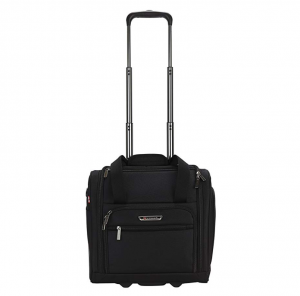 On its own, this suitcase measures in at 15 x 9 x 14 inches. This wheeled under seat comes in two semi-basic styles, both of which are business friendly and easily meet the professional level we expect from Steve Madden. 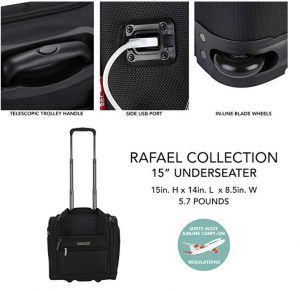 Make traveling easy by carrying or wheeling the 15″ TPRC luggage under-seat loaded with features including a side USB Port for charging your devices anywhere on the go with your own personal power bank. 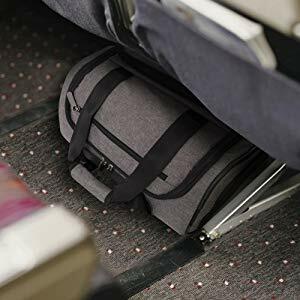 Also, stay organized with this piece designed with a spacious interior capacity, multiple pockets, but also a convenient shape for fitting right under the chair in most national and international flights. 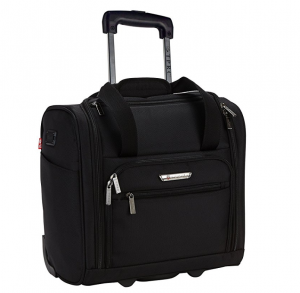 By way of storage this TPRC luggage offers front multi-use organizer pockets, an open side pocket to securely carry items like your cell phone or eyeglasses, and interior accessory pockets. 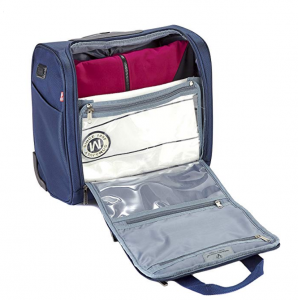 For main storage the front unzips and folds open for stacked room of up to 2-3 light outfits. Interior also includes a great watertight central container for those liquid or messy toiletries. 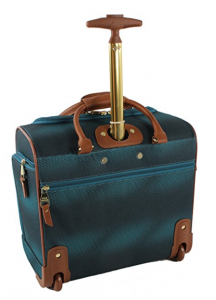 This under seat suitcase is made from polyester materials, meaning its design is on the weak side when it comes to drops and other similar impacts, though it should be quite strong against scratching and abrasions as well as any possible water damage. 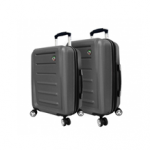 The best durability features for this case are its in-line skate wheels made from polyurethane as well as the aircraft-grade aluminum handle. 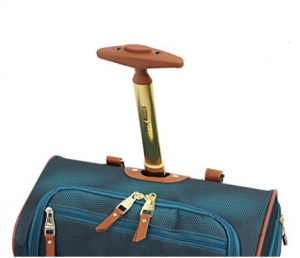 The important extra features include long zipper pulls that will not break even when the suitcase is overpacked, two handle systems – the telescopic handle and the tote handles – which pair nicely with the integral in-line skate wheels that are best for any surfaces between thick carpet and hard urban streets. This suitcase also includes a convenient side USB port opening; USB personal charger not included. Around 4.7 pounds unpacked, this suitcase also measures in at 14 x 8.5 x 15 inches and should fit comfortably under most national and international airline seats; otherwise, it will definitely fit into any available overhead spaces. 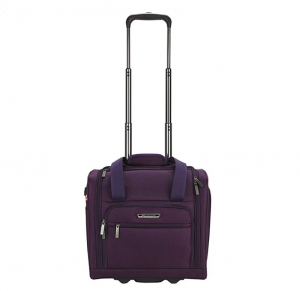 What’s really great is that this TPRC luggage offers three different styles all of which are ideal for the male or female traveler and include black, navy blue, and purple. 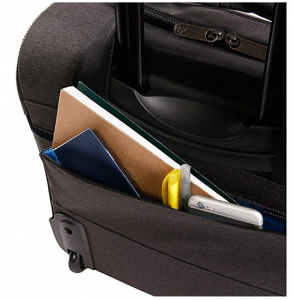 At 16.5 inches and with an oval design on top of the added pockets, this under seat offers the most storage space, although it’s possible that this could lead the bag to not fitting under all airline seats; which isn’t necessarily a problem when you consider that it will fit nicely into any overhead bin. Pockets include two side zippered pockets for glasses/etcetera, and two face zippered pockets with a third back zipper for accessing the interior. 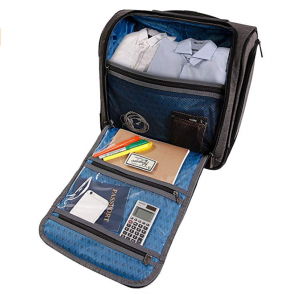 Interior pockets and storage include two laminated zipper pockets built into the inside opening flap, along with a middle divider that includes a mesh zippered pocket. All other space is ideal for stacked outfits. Our ORIGINAL PENGUIN review, or this part of it, was pretty happy to find that this particular under seat has been designed from cotton canvas materials for a padded suitcase that’s ideal for laptop or tablet protection as well as general added durability that’s a cut above polyester, but still not quite as strong as nylon fabrics would be. Other durability perks include the rolling in-line skate wheels made from polyurethane along with the telescopic locking handle crafted from aluminum. 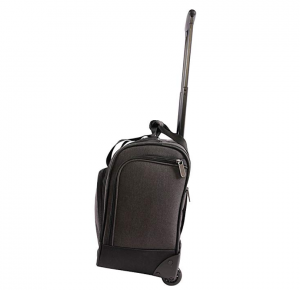 Compared to traditional shoulder bags, the smooth inline gliding wheels relieve your spine, back, knees and shoulders with its durable, lightweight construction; and even when you are carrying this as a tote, its quite lightweight and shouldn’t bother you while in a rush. 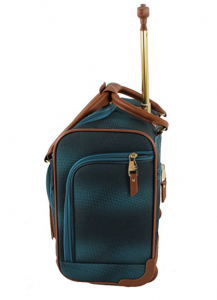 Other additional features include the long sturdy zipper pulls, the very deep right and left side exterior pockets, and a crosshatch pattern which further adds to the overall durability of this suitcases design. This suitcase measures in at 16.5 X 15.5 X 10 inches with an unpacked weight of 5.55 pounds (one of the heavier under seats on this list). At these dimensions this suitcase will definitely fit comfortably into any overhead airline bin (national and international), but there may be times that the suitcase doesn’t tuck under each and every seat before flight. As far as style options go, Original Penguin offers two basic business friendly styles that are Black Crosshatch and Grey Crosshatch. So, which brand offers at least the best under seat suitcase? Well, for the purpose, the storage, and the price, we think that Steve Madden offers the best look and great potential for packing on a short business trip or two-day getaway. 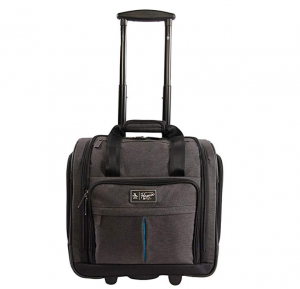 However, that said, TPRC Luggage created an innovative suitcase which easily offers more extras including unique pockets and a way to charge your phone via USB port (now that’s handy while on the go). Finally, we do have to admit that we find Original Penguin offers more than the TPRC under-seat, but only because it easily has a better durability (due to it’s cotton canvas design) and also easily has more storage space because of it’s overall size and amount of pockets.